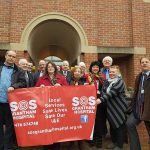 As Chair of SOS Grantham Hospital, I would like to extend a huge thank you to everyone who supported the SOS Grantham Hospital rally in August, our Protest March on 29 October and who has helped with our petition this year. We now have over 43,000 signatures. Special thanks to Jayne Dawson from Ancaster who collected over 14,000 signatures, and, to the hardy souls who have regularly attended the Wednesday evening vigils outside our hospital, including Fighting4Grantham Hospital followers. 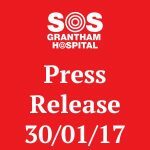 SOS Grantham Hospital are making plans to hand the petition over to Downing Street in January 2017. We are currently waiting for the date and time to be confirmed. We would like to thank Nick Boles (Cons) and Robert Jenrick (Cons) our local MPs, Ian Ashworth Shadow Minister for Health (Lab) and local councillors across all parties – and none – who have supported our campaign. Twice this year, our Councillors have set aside political differences and voted unanimously. First to oppose the night closure of Grantham A&E by United Lincolnshire Hospitals NHS Trust (ULHT) and last week at Lincolnshire County Council, to oppose the current draft of the Lincolnshire sustainability and transformation plan (STP) which includes the downgrade of Grantham A&E to an Urgent Care Centre. An Urgent Care Centre would not include the appropriately qualified staff required to provide vital life saving resuscitation in an emergency. As people across our county have stood by us we will stand by them. We extend our support to SOS Boston Hospital and to Skegness Hospitalwatch with whom we are working. At the Protest March I promised to pull together a programme of local life-saving First Aid courses and are progressing with this work with local training providers. We hope to start the first courses in January 2017. We will also encourage the provision of more defibrillators in our area. 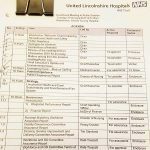 In the meanwhile, we must monitor and challenge ULHT plans which could alter services at Grantham Hospital, including General Medicine, without public consultation, even though they may have an impact on our future A&E services. 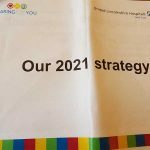 We will continue to fight locally and also nationally for our health services as research shows we are not receiving the resources we need from Government either. We wish everyone a Merry Christmas and especially our NHS staff who will be working over this period, facing an uncertain future, yet continuing steadfastly in their roles to serve us, nonetheless.